Avoid workplace arguments with this eclectic mix of office playlists to please everybody. Whether it’s Monday motivation you’re after or background music for the post-weekend slump, we’ve got you covered. Click through the links in the headers to shoot on over to Spotify and load them automatically. Start the morning off right. This playlist reminds me of mum listening to the radio every morning before I went to school. With the perfect mix of uplifting classics and modern-day essentials, get yourself in a good mood before you even open that first spreadsheet. 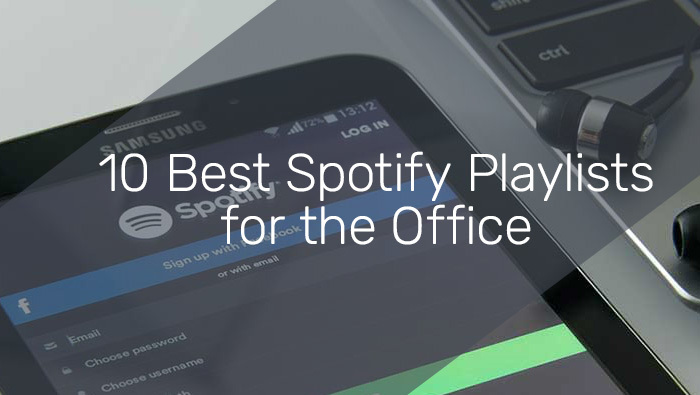 Avert office arguments, let Spotify pick the songs for you. Updated weekly, it includes a real mix of the best new music around from a variety of different genres. Any playlist that heavily features Toto, Kool and the Gang and Prince is a friend of mine. Circumvent the stresses and strains of the office by slipping into the mellow side of the 80s. Beware of constantly being asked to turn the speaker up. Cheerful tunes for the commute back. At least when you’re pushed against the window of the train you’re able to keep a smile on your face. Well, you hope. Feel like killing it today? Big riffs, heavy drums and even more distortion; nothing helps motivate you more than feeling like nothing can stop you, and that’s exactly what you’ll get from this playlist. We’ve all been there, no need to lie. For when work is dragging you down and you just want to wallow in self-pity, this playlist can help you do just that. Everyone loves Reggae, period. Particularly useful on a Friday when you’re trying to motivate people to come to the pub, or knock off early. It’ll put even the coldest hearted management types in the mood. Each office has them, those people that just want to listen to what’s in the chart. Indulge them once in a while, go on – you might like it. Songs you had forgot about, and quite a few you wish you could. Get those big hits from the past back in your head. Not just for Thursday mind. Last but not least, hark back to the time when indie ruled supreme in the UK and Alex Turner didn’t have the sharpest haircut in British music. Fancy going out on a limb? This random playlist generator takes one song you want to hear, and runs with it. Not only does it play some surprising choices, but it keeps you guessing what’s next. Join our mailing list to receive the latest news, tips and tricks from our team.